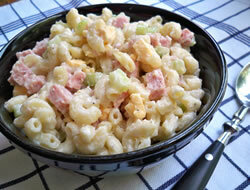 A basic macaroni salad that can be adjusted to your taste. You can substitute chicken, crab, or shrimp for the ham and add pepper, carrots, or cucumbers to make it just the way you like it. 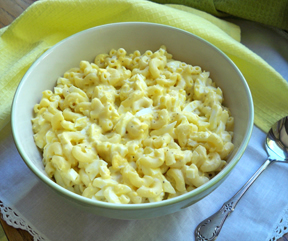 Cook macaroni, rinse with cold water, drain, and set aside. In a large bowl, add the salad dressing, milk, onion salt, pepper, and sugar; stir together until well mixed. 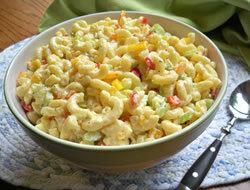 Add the drained macaroni to the dressing mixture; stir to evenly coat the macaroni. Add the ham, celery, and cheese; stir to evenly distribute. Taste test and add more onion salt, pepper, or sugar as needed. Note: Add or substitute desired ingredients. You could substitute chicken, crab, or shrimp in place of the ham. If desired, you could add other vegetables, such as peppers, carrots, and cucumbers. If you add other ingredients you may need to add a little more salad dressing so that the salad does not get too dry. 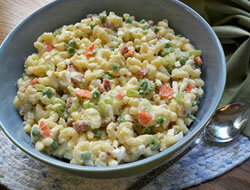 "An easy macaroni salad. I made it with chicken and thought that was really good. I think it would be good with ham too. It keeps well too so we enjoyed it for a couple of meals."